For the past 50+ years, the heart valve replacement (HVR) industry has gone through multiple growth phases in terms of innovation and market growth, and is now a formidable submarket of the cardiovascular medical device space. HVRs started off as small, compact simplistic devices made from synthetic parts. Now, these archaic prototypes have evolved into a diverse product offering from a multitude of small to large healthcare firms that range from completely synthetic materials to crosslinked tissue-based HVRs to new research being performed to investigate engineered tissue valves. These innovative leaps in technology and growth in commerce would not have been possible without the collaboration of multidisciplinary investigators unified through their passion in pursuing one goal—a superior healthcare option that resulted in a better quality of life for individuals throughout the world needing a new heart valve. 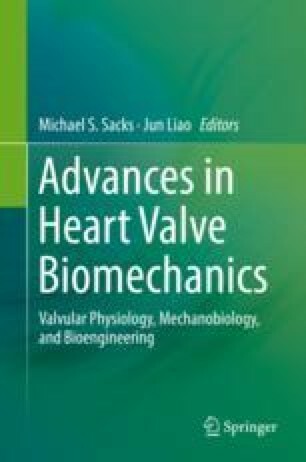 Everything from biomaterial design to micro/macro-biomechanics to build computational modeling to optimize valve design has been utilized to create the current product line and are currently still in use as our metrics and methods get more advanced to innovate the future of heart valves as well as cardiovascular device technology. The future of HVRs rests on academia and industry coming together to move technology forward to provide patients in dire need of a more durable HVR device. Therefore, the rest of the content covered in this book is a comprehensive review of current art and models in existence to design an effective HVR in the efforts of empowering individuals wishing to bring healthcare options to a patient segment in dire need of change. The following chapter will cover past and current approaches in designing and fabricating HVR materials, current performance of HVRs, material design considerations of next generation materials, and major research interests in the next generation of HVR materials. The rest of this publication will cover approaches in properly leveraging this base biomaterial in valve-specific design to innovate a more effective HVR.